Ole Zorn's Editorial was the text editor that completely reimagined how I could work from iOS. While I have since moved to Ulysses as my primary text editor, I still use Editorial almost daily for its unique Markdown automation. Editorial's combination of Python scripting and visual workflows for plain text editing is unparalleled and there's nothing else like it on the App Store. After a couple of years without updates and a long TestFlight beta period, Editorial has been updated for iOS Split View and the 12.9-inch iPad Pro. There are other changes (the workflow editor has been moved to the accessory panel and the Python editor now opens in a separate tab), but, overall, it's still the same Editorial you know and love, updated for the latest iOS devices. 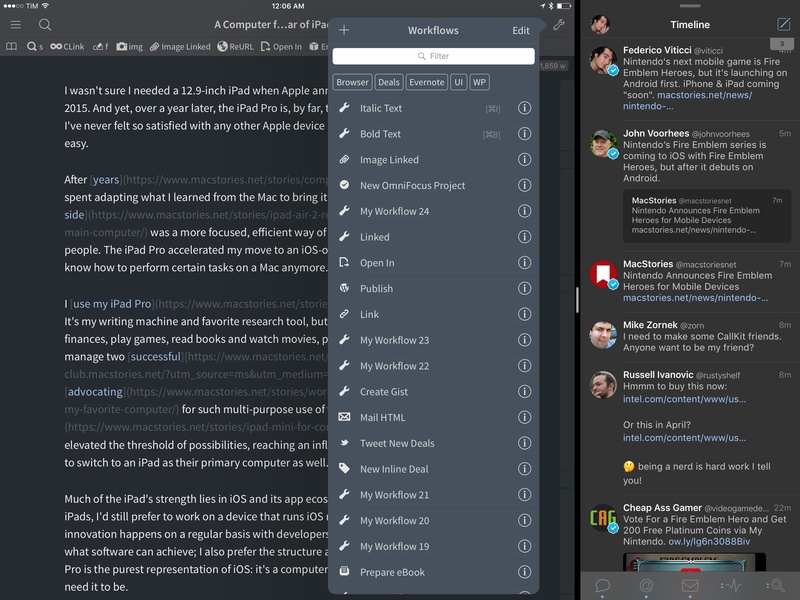 I've been using the beta version of Editorial 1.3 for several months now – being able to keep Editorial next to another app is great for editing and research, and moving back and forth between a document and a workflow is easier. As for everything else, my coverage of Editorial 1.0, 1.1, and 1.2 still stands; Editorial is the text editor for iOS power users thanks to its excellent automation features, advanced Markdown editing, and TaskPaper integration. As I wrote in November, I still edit all my longform stories in Editorial. Despite the paucity of updates, I love the app as it's a shining example of pro software for iOS. If you haven't played with Editorial in a while, now's a good time to check it out again (the app is also available at a discounted price of $4.99). In need of a project to learn on, I decided to take a Python script I wrote last year for connecting to a server and manipulating files over FTP (File Transfer Protocol) and build a User Interface for it. I continue to be amazed by the breadth and versatility of Editorial's UI module. 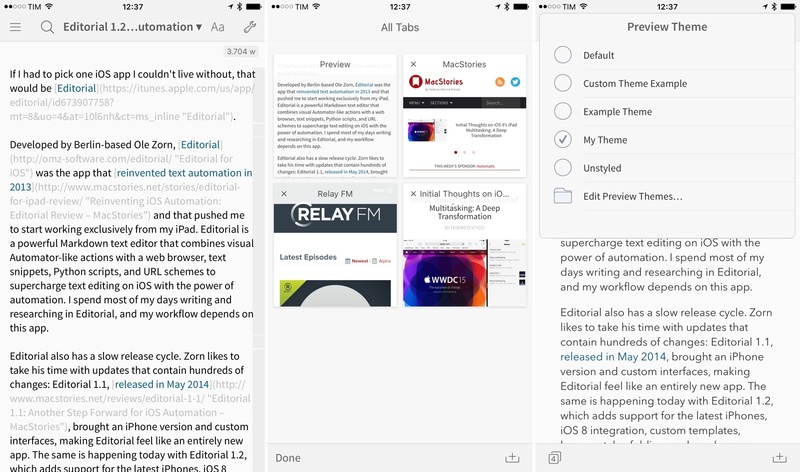 I can't wait to see how iOS 8 and extensions will fit with Editorial's automation and workflow creation features. Since my review of Editorial 1.1, I've been keeping an eye on the workflow directory and I've come across some great UI workflows worth linking to. Editorial users are coming up with amazing ideas to enhance the app, and I can't wait to see what Ole does with extensions on iOS 8. Editorial developer Ole Zorn has created a workflow showing how the new Editorial can tag parts of speech in text to highlight lexical classes like nouns, verbs, adjectives, and more. The linguistictagger module is a new Python addition in Editorial 1.1 and it's reminiscent of the part of speech highlighting found in apps like Phraseology and Writer Pro. In Editorial, you won't get any editing features, but the basic syntax highlighting will still come in handy to understand how you write when reading a document in the Syntax preview. Also from Zorn, check out two UI workflows to display a sidebar for Wikipedia and a Markdown preview while writing in the text editor. In my review of Editorial 1.1, I covered the app's new support for x-callback-url and how it improves inter-app communication. In hindsight, I left out a fairly obvious demonstration of the feature: the possibility to create workflows that send multiple items in a row to other apps. 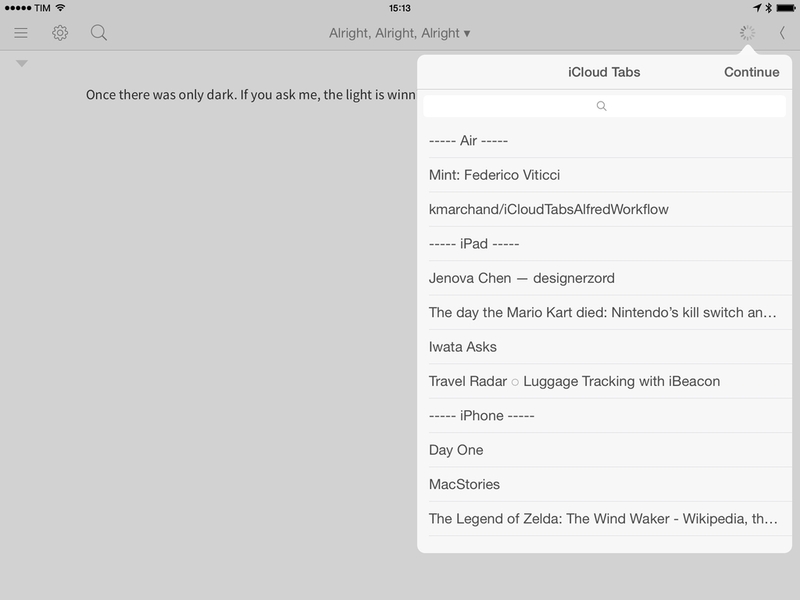 For this post, I'm going to use Fantastical as an example. 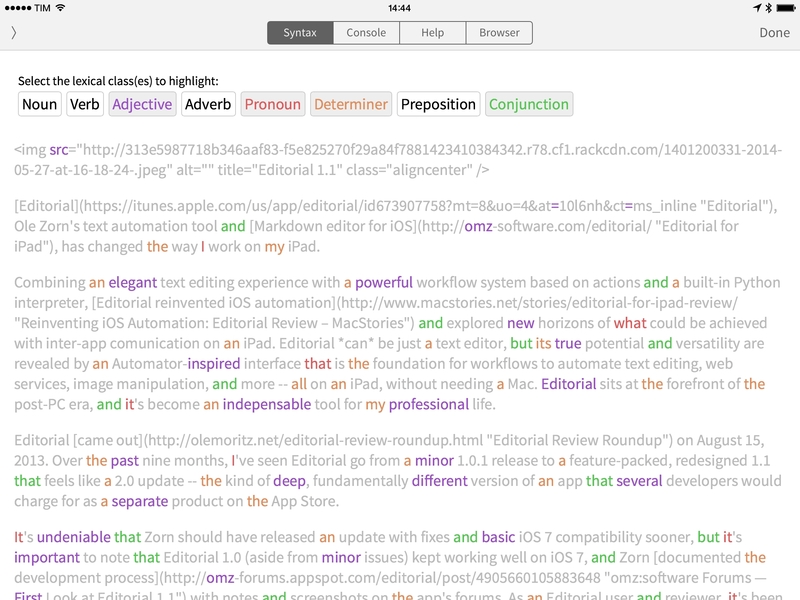 Editorial, Ole Zorn's text automation tool and Markdown editor for iOS, has changed the way I work on my iPad. Combining an elegant text editing experience with a powerful workflow system based on actions and a built-in Python interpreter, Editorial reinvented iOS automation and explored new horizons of what could be achieved with inter-app comunication on an iPad. Editorial can be just a text editor, but its true potential and versatility are revealed by an Automator-inspired interface that is the foundation for workflows to automate text editing, web services, image manipulation, and more -- all on an iPad, without needing a Mac. Editorial sits at the forefront of the post-PC era, and it's become an indispensable tool for my professional life. Editorial came out on August 15, 2013. Over the past nine months, I've seen Editorial go from a minor 1.0.1 release to a feature-packed, redesigned 1.1 that feels like a 2.0 update -- the kind of deep, fundamentally different version of an app that several developers would charge for as a separate product on the App Store. It's undeniable that Zorn should have released an update with fixes and basic iOS 7 compatibility sooner, but it's important to note that Editorial 1.0 (aside from minor issues) kept working well on iOS 7, and Zorn documented the development process with notes and screenshots on the app's forums. As an Editorial user and reviewer, it's been a long journey from version 1.0 in August 2013 to today's 1.1 release, but it's been worth it. 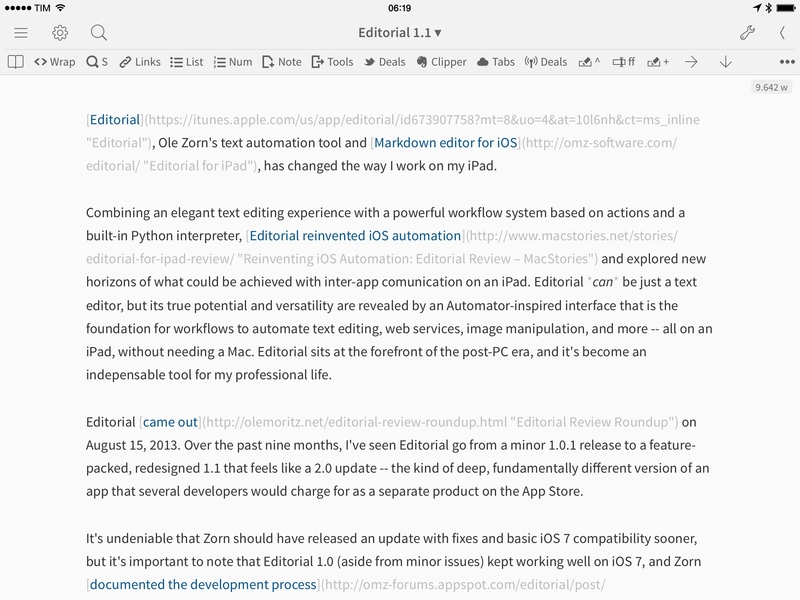 Editorial 1.1 brings a plethora of design changes, Markdown improvements, and automation breakthroughs that, just ahead of iOS 8, represent a major milestone for Markdown text editors and iOS automation. Editorial 1.1 may be a text editor on the surface, but, in reality, it's a small revolution for iOS power users. It's not just a module, there's also an integrated visual editor for setting things up without code, and in Editorial there's also a way to build UIs around workflows, without having to write Python at all (though you can also mix and match). Before you get the wrong idea: This is in no way a complete wrapper around UIKit or some kind of Cocoa bridge, so you won't be able to do a all the things you could do in a native app, but it provides a (hopefully) easy-to-use and pythonic way to create UIs that look and feel “at home” on iOS, and it's possible do some relatively advanced stuff with custom drawing and touch handling. For Editorial, I tend to think of this as a “plugin” interface that allows the creation of workflows that are nearly indistinguishable from native features. Obviously, this won't be for everyone, and there will definitely be a learning curve, but given what I've seen this community come up with, I'm pretty confident that it will enable some people to really push the limits of iOS text automation (and others to reap the rewards via shared workflows). I can't stress this enough – the new module fundamentally reinvents the way you can build visual workflows in Editorial, and I can't wait to share more about the workflows I've been working on. Make sure to check out Ole's post for screenshots of Editorial 1.1 on the iPad and iPhone.